If you haven’t experienced the way your face feels after using a cleansing brush, you are going to be very happily surprised. Cleansing brushes are an amazing tool because they do two things. They help keep pores clean on a daily basis and, they’re good for circulation. You will be shocked at how nice your face will feel after the first use of the Sonic Cleansing Brush Bright Touch. My pores were reduced and my face felt cleaner than it has since I was a youngster. Love the fact that it is waterproof so I can use it in the shower. 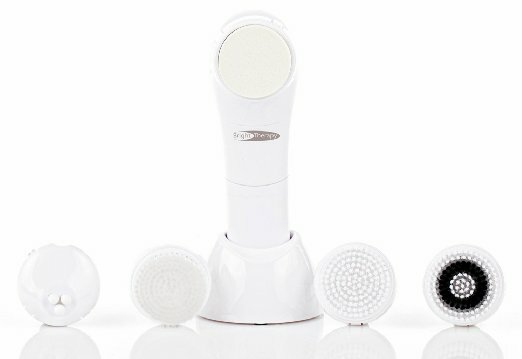 The BrightTherapy Professional Sonic Skin Care System is a waterproof sonic skin care brush system that gently cleans, exfoliates, hydrates and tones skin. See radiant skin and feel fresh after the first use. 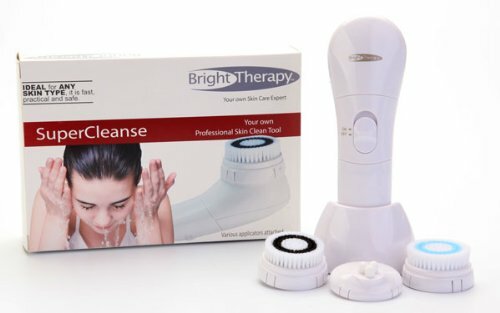 More than eight times as effective than manual cleansing, the BrightTherapy Professional Sonic Skin Care system leaves skin feeling renewed, rejuvenated and with restored firmness. Perfectly suited for normal skin the BrightTherapy Professional Sonic also does wonders for conditions such as seborrheic dermatitis, rosacea and acne. BrightTherapy Professional Sonic reduces the effects of sun damage and acne scarring. The Microdermabrasion brush head (made in Japan) exfoliates skin to help minimize wrinkles. Minimizes pore size and other skin imperfections or use the massage action to stimulate the production of new and healthy skin cells. Since the BrightTherapy Professional Sonic is waterproof it can be used anywhere including the sink, shower or in the bath. Included are 3 brush heads and a convenient stand. Cleansing Brush (heads are made in Japan)- Remove residue, dirt, and makeup in seconds. More effective than manually washing. Exfoliation Brush head (made in Japan)- Most effective way to exfoliate your skin. Up to 8X more effectively than by hand. The Sponge Applicator for Hydration offers up to 2 x greater absorption of serums and moisturizers. Facial Massage Head for Toning and lifting skin. Lift, sculpt, tone facial muscles, and rejuvenate sagging skin. *Requires 2 Alkaline AA batteries. The BrightTherapy Professional Sonic beauty care system. Waterproof! Includes 3 interchangeable heads designed for cleansing, exfoliation, hydration, and toning. Cleansing Brush head is made in Japan! Remove residue, dirt, and makeup in seconds. More effective than manually washing! Exfoliation Brush head made in Japan! Most effective way to exfoliate your skin. Up to 8X more effectively than by hand. Sponge Applicator for Hydration. 2 included FREE only if you click on the Special Offer button! Offers up to 2 x greater absorption of serums and moisturizers. 5 head set. soft, medium, and firm brush, sponge, & Massage. Facial Massage Head for Toning and lifting skin. Lift, sculpt, tone facial muscles, The BrightTherapy Professional Sonic is waterproof so you can use in the bath or shower! It's Time to look and feel younger.